Once you’ve set up your Facebook Pixel and added it to your Teespring Account it’s time to explore the different ways you can use it! Check out our video tips below on using the pixel to create Lookalike Audiences and Website Conversion Ads. If you’re just getting started with pixels check out the link above first. What are the differences between the old Facebook pixels and the new one? Find out how to set-up and use the new pixel for your Teespring campaigns in the video below. When you first visit your Facebook ads manager go to the drop-down menu next to where it says ‘Ads Manager’ and go to ‘Pixels’. Under the tab ‘Facebook Pixel’ you can create your ad account’s tracking pixel. What you will need is the ID code which is a 16-digit number. Copy this code and go to your Teespring dashboard. Under ‘Settings’ in the tab ‘Conversion Tracking’ you can paste that number in the field ‘Facebook Pixel’ (make sure the box ‘Upgrade to the new Facebook Pixel’ is ticked) – this way the pixel will be placed on all listings you launch with Teespring. Now, whenever you launch an ad on Facebook make sure your Facebook pixel is linked to it. 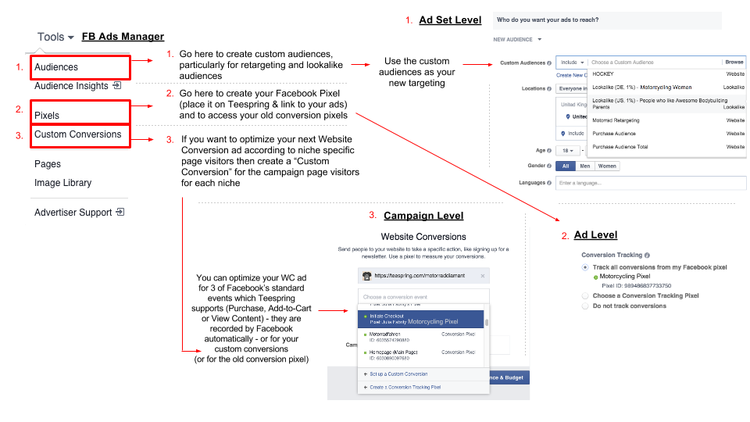 On the ad level (sometimes under ‘Advanced Options’) tick the box ‘Track all conversions from my Facebook pixel’ before launching the ad. Once you’ve completed these steps your ads will be connected to your Teespring listing pages. In your Facebook ads dashboard you will then be able to see the data for each individual ad and how many conversions (i.e. sales) the pixel recorded, how many people clicked ‘add-to-cart’ and how many people viewed the content (i.e. your campaign page). Simply go to customize columns and search for “Facebook Pixel” to find these metrics. What are the advantages to using Website Conversion Ads? How can you separate buyers based on their niche with the new pixel? Get the answers to these questions and receive more helpful info in this video. The goal of a Website Conversion ad is to show your ad to people who are most likely to complete a purchase. While a Page Post Engagement ad can help you reach a broader audience (for example through engagement/shares) a Website Conversion (WC) ad is purely focused on sales. Facebook uses the pixel to analyze your target audiences to find out which users are most likely to buy a product (i.e. convert); as you ad generates conversions the pixel records your buyers and find characteristics they have in common with other FB users, and adapts your targeting to find more users with these same characteristics (because based on the data, they are more likely to convert). Any time you launch a new ad targeting the same niche (but perhaps a bigger audience) you should use the same pixel because Facebook will find the characteristics your past buyers have in common with your new target audience. If it finds people with similar characteristics it will serve the ad to those people primarily. This means that the more buyers your pixel has recorded, the more accurate Facebook’s analysis of your past buyers will be and the more you will benefit from it in your WC ads. What this also means is that later on, when you find new niches, you will start using different tracking pixels for each niche. The reason for this is that buyers from the nurse niche most likely have different characteristics compared to buyers from a rugby niche, therefore we want to analyse those buyer pools separately and optimize future nurse ads with the nurse pixel and future rugby ads with the rugby pixel. Find out how to create a bucket of page visitors for your retargeting ads, and how to create new Lookalike audiences based on past buyers. Keep in mind you need to have at least 100 people in your source customer group to create a Lookalike Audience. The more people in your customer group, the more accurately Facebook can find new users who look like them. If you don’t have enough purchases recorded with your pixel, you could focus on using the people who visited your campaign page to create a Lookalike audiences instead. Another reason why we want Facebook to not only track buyers who complete a purchase but also listing page visitors (see ‘View Content (Facebook Pixel)’ in your FB ads manager) is so we can follow-up with those people who showed an initial interest in the product. By initial interest we mean people who click on the ad (i.e. showed interest) and went to the listing page but dropped off before completing their purchase. Since we know they were initially interested we want to follow up to see if we can get them to purchase after all. By collecting the information of all interested page visitors from your Facebook ad you can then set up an ad to retarget them (i.e. show them another ad for the same listing again). This is usually a reminder advert (‘You only have 2 days left to get this awesome tee’ / ‘Don’t miss the chance to get yours now’) which will ideally get them to complete their purchase. Keep in mind Teespring Marketing includes boosted retargeting along with other paid promotion elements. In the videos above we discuss several different Facebook Ad tools you can use for conversion tracking and custom audiences. We’ve created a summary image below of the different tools and how you can use them to clear up any confusion.